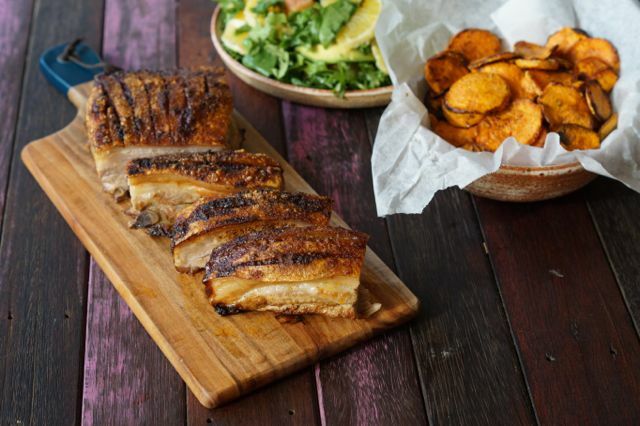 Since eating paleo we’ve discovered a great love for Pork Belly. 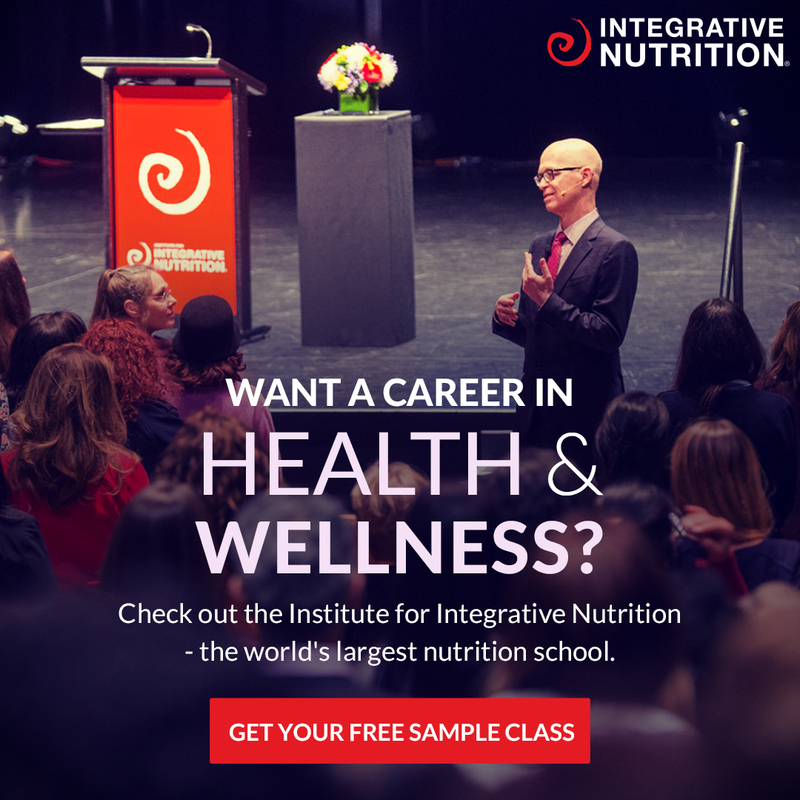 We’re pretty sure every person on the paleo journey has made this discovery! YAY for fats! When out to dinner and we see those two words PORK and BELLY on the menu there’s usually a squeal and/or happy dance. 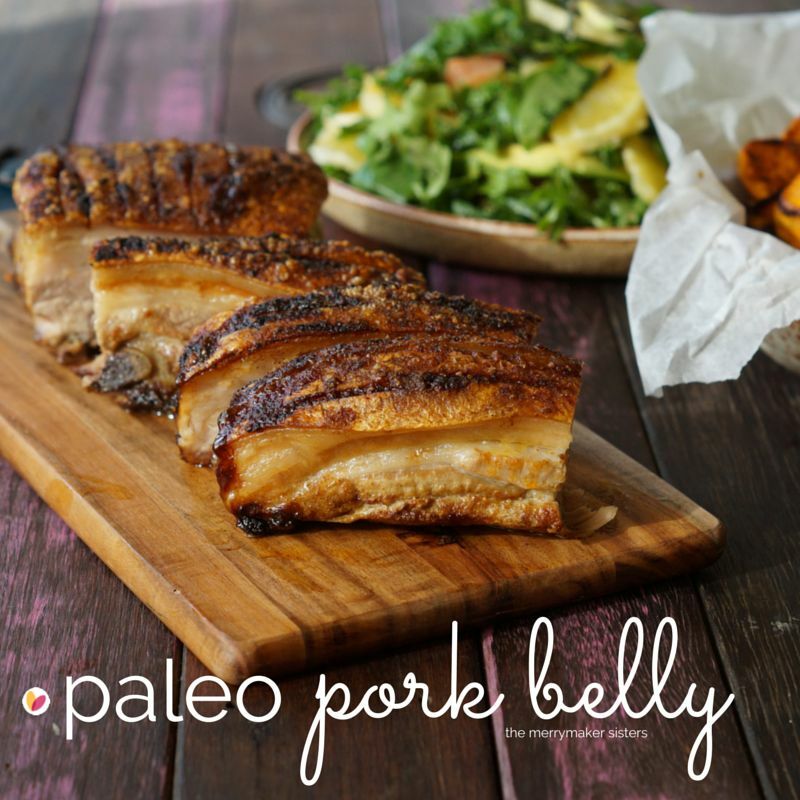 So it was definitely about time we attempted to cook up some amazing crunchy paleo pork belly! We’re huge believers in tooting you’re own horn… it’s official merrymakers can cook pork belly, merrymakers can cook pork belly real good! The meat was soft and juicy and the crackling was actually crunchy. Yep… there was a lot of crunching going on at the dinner table! This perfect paleo dinner recipe is making a come back to our table very soon! Tomorrow soon! 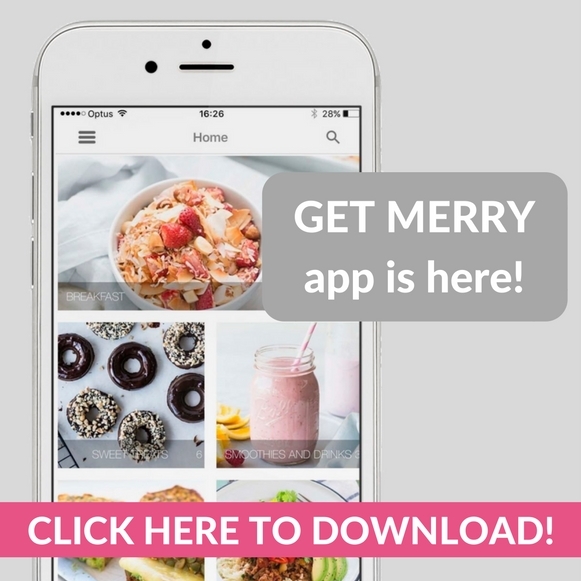 We hope you love the recipe as much as us! In a small bowl combine all the herbs, spices and garlic. Place the pork belly skin side up in a greased roasting pan. Pour over half the oil and season really well with salt. Sprinkle the spice mix over and rub it in to the pork skin, make sure you get the spice mix into those scores! Pour over the remaining oil and season with a little extra salt. Place the pork into the oven for 20 minutes, watch that skin puff and crisp up! Turn down the oven to 160°C (320°F) and cook for a further 1 hour. If the skin isn't quite crisp enough (boohoo!) place under a hot grill for 5-10 minutes. Allow the pork to rest for 10 minutes before cutting and serving!